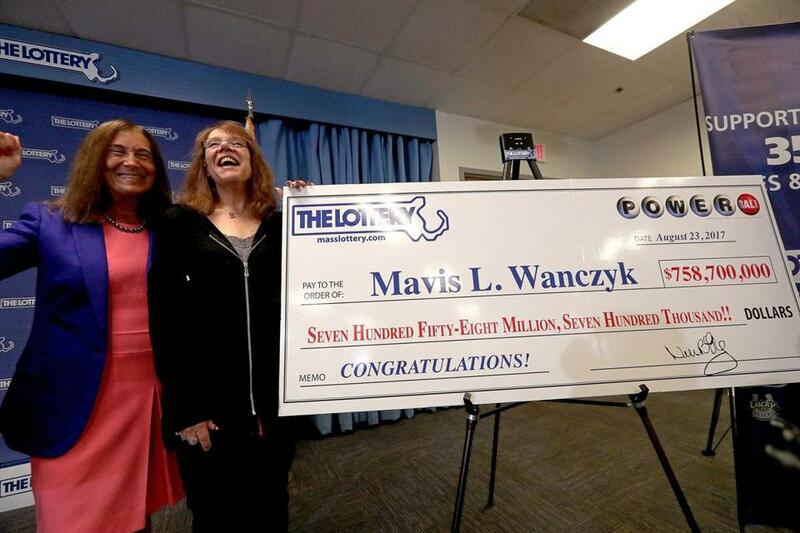 Powerball jackpot winner Mavis Wanczyk (right) with Mass. State Treasurer Deborah Goldberg. BRAINTREE — It’s the biggest lottery jackpot ever won by a single ticket-holder. But in its moment to share in sweepstakes glory Thursday morning, the Massachusetts State Lottery got the location of the winning $758.7 million Powerball ticket wrong. In an announcement at 2:36 a.m., the lottery said that the Handy Variety store in Watertown had sold the huge ticket. The misstatement triggered hours of confusion, as the owner of Handy Variety was deluged with calls and media requests to identify the lucky winner. Sorry, Mr. Singh. By 6 a.m., lottery officials had realized their mistake and a couple hours later identified the correct winning location: Chicopee, 80 miles to the west. The Watertown store, they explained, had sold a $1 million winning Powerball ticket, and they had simply mixed up the two when preparing the announcement. The mishap mattered little to Mavis Wanczyk. Smaller prizes range from $4 to $1 million. 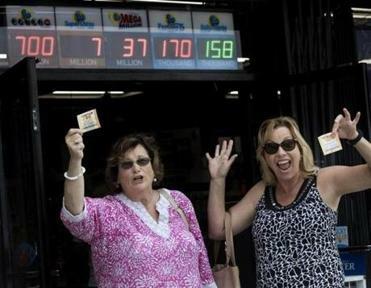 Read: OK, so you just won $759 million. Now what? A 53-year-old resident of Chicopee and mother of two adult children, Wanczyk was leaving work at Mercy Medical Center in Springfield Wednesday night when a friend recited the winning Powerball drawing. As each of the six numbers were read off, she checked them off against her ticket: “I have that. I have that. I have that.” Then, paralysis set in as it dawned on Wanczyk that she was $758.7 million richer. “I couldn’t drive anywhere, I couldn’t do anything,” a much more composed Wanczyk recalled Thursday afternoon at lottery headquarters in Braintree, where she accepted one of those stunt oversized checks that, for once, seemed to match the moment. By then lottery executive director Michael Sweeney had explained the sequence of events that caused the agency to mistakenly identify Handy Variety as selling the winning ticket. The trouble started with a printout his staff had received notifying the lottery that Massachusetts not only had the jackpot winner, but two $1 million winners as well. The winning ticket had actually been sold at a Pride Station & Store location in Chicopee. (A second $1 million winner was sold by Sandy’s Variety in Dorchester.) Standing in front of the Montgomery Street store, the head of the Pride Station chain, Bob Bolduc, said the company would donate its $50,000 commission from selling the winning ticket to local charities. Meanwhile, back in Watertown, the Handy Variety owners were left to politely deflect congratulations from customers who were dumbfounded to learn the moment of fame was fleeting — and misplaced. Like many regulars, Wanczyk has a lucky number — “our number is four,’’ she said — that she and her mother, stepfather, and another friend play every Friday night when they go out to dinner and play Keno. So it only adds to the lore of her story that the last number in the winning sequence, the so-called Power Ball number that put Wanczyk into another income bracket was . . . four. “It worked to my advantage,” she quipped. The full winning combination was 6-7-16-23-26-4. Wanczyk said she bought five tickets, and Powerball said the odds of winning were 1 in 292,201,338. Instead of taking the full $758.7 million over 30 years, Wanczyk chose the lump sum payment of $480,500,936, which comes to $336,350,655 after taxes. While this was the largest jackpot for a single player, it was not the largest prize awarded by Powerball: three players split $1.6 billion in 2016. For now, Wanczyk said, she had few plans beyond paying off a new car and getting out of the limelight as fast as possible. “I’m going to go hide in my bed,” she said, drawing laughter at the lottery event. Globe correspondents Sara Salinas and Ben Thompson contributed to this story. Emily Sweeney can be reached at esweeney@globe.com. Follow her on Twitter @emilysweeney. Travis Andersen can be reached at tandersen@globe.com. Follow him on Twitter @TAGlobe. John R. Ellement can be reached at ellement@globe.com.